From 0 to 100 km/h in 1.513 seconds – that’s a new world record for electrically powered vehicles. It was set by AMZ’s “grimsel” race car in June 2016. Their latest machine bears the name “gotthard. The project is backed by the Academic Motor Sports Club Zurich (AMZ), founded in 2006 by students of ETH Zurich. Every year, the club develops a prototype for the various Formula Student events all over Europe. 130 teams from over 30 countries attended this year’s contest on the Silverstone racetrack. After three cars with combustion engines, AMZ has been building fully electric cars since 2010. Seven of the zippy vehicles have been built to date, each named after a famous Swiss mountain pass. This year’s car, the 10th from the AMZ workshop, bears the name of the Gotthard pass. 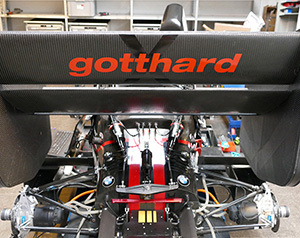 “gotthard” weighs a mere 172 kilograms. With 216 horsepower, the power-to-weight ratio is 1.26 HP/kg, a value that exceeds even supercars and gives the car its enormous acceleration. Read more in the latest issue of “driven“.